The original puppet drama was made up of 5 acts. "Shunkan", a scene frequently staged nowadays, was the final scene (kiri) of the second act. In the days when Taira Kiyomori [1118-1181] ruled Japan, there were many attempts to overthrow him, because he was extremely arrogant and relentless in persecuting those who displeased him. One such attempt, the Shishigatani plot, was made by three men: a priest and two noblemen. Their names were Shunkan, Taira Yasuyori, and Fujiwara Naritsune. Their plot was discovered and they were apprehended at Shunkan's residence. Subsequently all three were exiled to Kikai-ga-Shima, a lonely island some distance from Kyûshû. 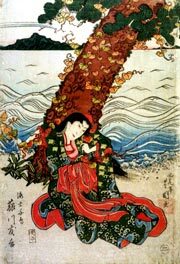 A few years later an amnesty is granted upon the birth of a son to the Empress, Kiyomori's daughter, and the exiles are allowed to return to civilization. Shunkan and the two other men are living along a rocky shore on Kikai-ga-Shima Island. Shunkan is old and weak, but is supported by his companions, who still love and respect him. Yasuyori comes to tell him that Naritsune has fallen in love with a pretty, young diver on the island. 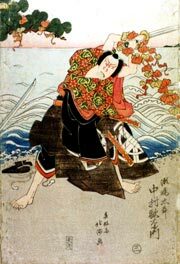 Shunkan congratulates the young couple and bestows the name Chidori upon the young diver (ama). In the presence of such noble men the young girl cannot remain calm. Shunkan performs the marriage ceremony, but since there is no sake wine for the ceremony, the bride and groom pledge themselves to each other with sea water. Shunkan tells Chidori that if her husnand is pardoned, she will become the Lady of Tambe. Wishing to perform an auspicious dance in honor of the young couple, Shunkan grabs a paulownia leaf and begins. His age and weak physical condition prevent him from dancing well, but he laughs off his poor performance so as not to worry his companions. At this very moment a ship approaches the island, enters the cove, and disembarks a messenger, Senoo Tarô Kaneyasu by name. He announces the amnesty. Mercilessly Shunkan's name is not included in the order. But when a second messenger, Tan Saemon Motoyasu, disembarks, he brings with him a second order. Because he was regarded as the leader of the failed plot, Shunkan had been excluded from the amnesty. But, on the intervention of one of Kiyomori's chief councillors, his sentence has been mitigated and he may return as far as Bizen Province in Kyûshû. He takes great delight in the news. Taking Chidori with them, the three exiles are about to board, when Kaneyasu stops them. He insists that the girl must be left behind. Protesting, Naritsune informs Kaneyasu that the girl is now his wife. But Kaneyasu continues to deny her passage. 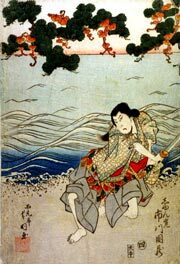 When Naritsune states that he too will remain on the island, he is taken aboard by force. Chidori is left alone on the shore. Shunkan returns and tries to smuggle Chidori aboard the ship, but is prevented by Kaneyasu. Shunkan appeals again to his mercy, but Kaneyasu mocks him and takes pleasure in informing him that he will not find his family awaiting him in Kyûshû. He further explains that Shunkan's wife is dead, and his son has long been missing. Overcome with grief and rage, Shunkan finds new strength and, wrestling Kaneyasu's sword away from him, kills his tormentor . He then thrusts Chidori on board, telling Motoyasu that, since he has now forfeited his precious pardon, Chidori can go in his place. All bid Shunkan a sad farewell, and the ship sets sail. Shunkan clings to the mooring rope (tomozuna), his last link with the homeland until it is jerked from his hands. He watches the ship grow small in the distance and climbs from rock to rock trying to keep it in sight, until at last it vanishes over the horizon. Shunkan strikes the famous Kan U no mie after having killed Senoo Tarô.